Can't attend? Follow Hard Rock Cafe Singapore to know of future events! 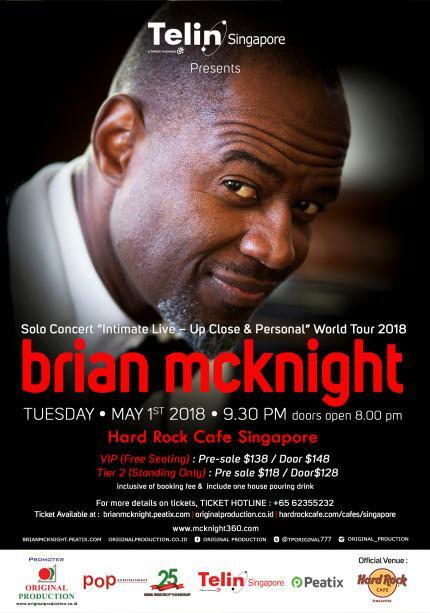 Nominated sixteen times by Grammy-nominated R&B crooner Brian McKnight is returning to the Indonesia & Singapore once again to entice his fans. The famed music icon who is most recognised for his strong falsetto and belting range, will be showcasing his talent to the audience. McKnight has collaborated with performers across every genre including Quincy Jones, Stevie Wonder, Justin Timberlake, David Foster, Mariah Carey, Diddy, Christina Aguilera, Rascal Flatts, Nelly, Vanessa Williams, Willie Nelson and Kenny G. etc..